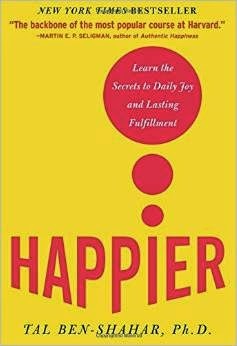 Happier is a book mentioned in Delivering Happiness (Zappos). It is a book for us to learn to be happy. Or at least to understand what happiness is. It meant happiness is a binary. It meant that happiness is a point that you can reach. However, this point does not exist, and clinging on to this belief will frustrate you. Rat racer is a slave to the future. Hedonist is a slave to the moment. Nihilist is a slave to the past. When climbing a mountain, you focus on the peak (your goal), so that you stay on course. You have to enjoy every step, and the whole journey (process), not just the peak. Goals are means, not just ends. Help others. Contributing to others’ happiness will provide you with meaning and pleasure. Introduce happiness boosters. Provide yourself with pleasure and meaning even for a short moment. Look within yourself and ask the important question. Imagine you travel 10 years to the past and advise your younger self, what advise would it be? Now, think what your older self will advise you to be happier. Come to think of it, we learn many things from books, yet we never learn about happiness - which is obviously the most important thing in life. Happier is a book that should be read by all.